Edward Payson Weston walked. He walked far, and he walked fast, but the walks were merely incidental to peddling his mother’s romance novels door to door in Massachusetts and Connecticut. Over dinner with a friend in a Boston pub, Weston put his skills on the line. When the conversation turned to politics, Weston vociferously argued that Lincoln could never be elected. His friend disagreed, and a bet was struck. If Lincoln won, Weston would walk from Boston to Washington D.C. over a period of exactly 10 days in time to witness Lincoln’s inauguration; if Lincoln lost, his friend would do the same. Until he lost the bet, Weston never realized that walking could, in and of itself, be a paying proposition. He departed Boston in a snowstorm and began his way to Washington. He would have made it within the 10 days too, had he not been arrested for debt twice en route. As it was, he arrived a few hours late, not soon enough to make it to the Inauguration itself, but in time to attend the ball which followed. The newspaper had covered Weston’s trip, and friends arranged a meeting with Lincoln, who graciously offered to pay his train fare back to Boston. Weston politely declined, having not made the trip in the required 10 days, he preferred to repeat the walk back, and sure that he could make it in the mandated time. During the Civil War, Weston served as a part-time spy, with camouflage of a sort specially created for him by the Brooks Brothers. After a few adventures in Maryland, Weston set aside his unofficial spy duties, and wrote a book of his adventures which sold tolerably well. There was not much of a market for a man whose claim to fame was walking, but at least a job at a newspaper kept him employed and fed both his gambling habit and his family. He wrote the crime news, and the New York Sun could beat other papers with a scoop because Weston eschewed public transportation; while other reporters rode the horsecars back from a crime scene, Weston would leg it at a faster rate than any omnibus. Plopping into his seat at the paper, he’d turn to a companion and remark “By George, we got the Herald sure this morning, ripping murder up in Harlem.” Putting pen to paper, he wrote nearly as fast as he walked. Weston lusted for a more extravagant lifestyle – horses, houses in the country, and natty attire suitable for a gentleman. So he fastened upon an idea. He convinced sportsman George P. Goodwin to back him in a $10,000 wager; Weston would walk from Portland, Maine, to Chicago, Illinois, some 1200 miles, in 30 days, for which Goodwin would pay Weston the sum of $1,000. T.F. Wilcox, a noted gambler, took the bet, and upped the stakes, if Weston would cover 100 miles on one of the days, an extra $2,000 would be awarded. Weston added one further condition; he would not walk on Sundays, out of respect for his mother’s wishes that he not labor on the Sabbath. In late October, Weston set out for Chicago, accompanied out of Portland by none other than Henry Wadsworth Longfellow. Weston succeeded in his 100 mile attempt on the tenth try, and strolled into Chicago on the 30th day with a few hours to spare. Fortunately, Goodwin had covered the cost of the horses which pulled the judges accompanying him, for Weston wore out four of them. Weston continued to perform, mainly indoors where he could collect a portion of the gate receipts. Boys all across the country imitated his manner of whipping his calves with a switch, which Weston claimed kept the blood flowing. Seeing Weston’s financial success, competitors arose, including Daniel O’Leary of Chicago. O’Leary proved to be a better walker, beating Weston in several head-to-head matches. Weston fled to England but initially was unsuccessful in gathering much attention. After declaring bankruptcy in 1878, Weston managed to arrange an introduction to Lord Astley a noted sportsman. When His Lordship complained of knee troubles, Weston introduced him to a special trick all his own; walk up and down stairs backwards to reduce pressure on the knee. Knee pain gone, Astley became a firm believer in Weston and pedestrianism, the name bestowed upon the new sport, so much so that he sponsored a pedestrian challenge named after himself. The Astley Belt contests were multi-day affairs; the contestants erected tents on the ground, and split their time between walking and sleeping, with the occasional break for food. The winner was he who could walk the longest distance in six days; the entry fees, the gate receipts, and a cash prize would be awarded to the winner. Anyone could challenge the holder of the Astley Belt, who had to accept the challenge or forfeit the Belt. He who won the Belt three times running would hold it forever. Weston lost the first two races badly and did not participate in the third, unwilling to return to America anything less than a resounding success. 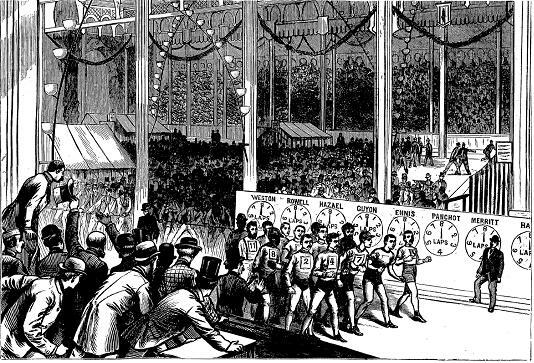 When the fourth contest was announced, Weston began to train, and by the time the contest returned to London in June 1879, Weston was ready. Fortune favored him. Charles Rowell, the presumptive favorite, was out with an injured foot, and a few days before the race the speedy John Ennis went down with an injury. He’d pulled his hamstring rescuing a rather large woman who he’d come across drowning in the Thames. Two other racers dropped out the second day, leaving only Weston and “Blower” Brown. Weston demolished him, making 550 miles in six days, winning £500 and cleaning up on a side bet with Astley for £2500. Now he could return to America in triumph. Challenges followed, and sponsors quickly scheduled a match in Madison Square Garden, which was, at that time, still located in Madison Square and still a garden – an open air sporting arena complete with shrubs and trees. This time, there were no fortuitous injuries, and there was a larger field of runners, with some twelve racers, including one Hart, who broke pedestrianism’s color barrier. Each racer had a tent on the grounds, which came complete with running water, a cot, mattress, table and bathtub- all provided by an enterprising local furniture dealer on the condition that he be allowed to emblazon his name on the tents’ side. Weston finished in sixth place. He blamed his loss on the thick pall of smoke which hung in the air, wafting upwards from thousands of cigars. Besides which, the sport had changed from the one which Weston had popularized. 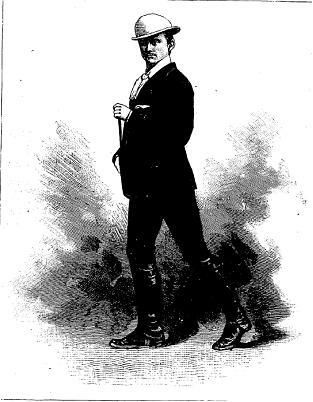 Pedestrians no longer wore the dignified coat, tie, breeches and bowler Weston championed, but appeared attired in a loss fitting shirt and tight boxer’s leggings. Worse, contestants no longer confined themselves to a stately fast walk, but competed by skipping and even using the uncouth “jog trot.” Feeling pedestrianism was no longer sporting, and Weston announced his retirement from competition, and became a temperance advocate; giving walking displays in the United States and England as a demonstration of the role avoiding alcohol played in good health. Meanwhile, the velocipede, soon nicknamed the bicycle, promised faster races and thrilling crashes, eclipsing pedestrianism itself as a spectator sport. The reader is encouraged to try Weston’s technique; it actually works if one is willing to suffer onlooker’s stares.